What does Buhari victory mean for Africa? After the anxiety and drama of the past few days in Nigeria, it is tempting to get carried away by the impact of this ballot - what it represents for both Africa's largest democracy and for those countries on the continent still wrestling with the notion that power can change hands without the world coming to an end. The significance of General Muhammadu Buhari's victory should certainly not be underestimated. An electorate that has savoured the rich experience of ousting an incumbent by the mere act of voting cannot easily be persuaded to forget it. And that must surely be a contagious experience on a continent where, it is often said, roughly one in five people are Nigerians. Besides, this was no "people's revolution" - something that the continent's remaining strongmen could loudly dismiss as a dangerous threat to the natural order of things. 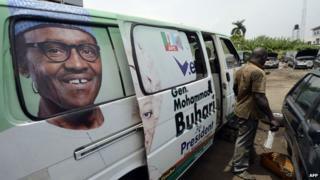 Instead Nigeria's election was something much more prosaic, and more subtle - a challenge to entrenched autocracy. It was, despite the disruptive efforts of a few, a very ordinary thing: A peaceful, modern, well-monitored, uncontestable transfer of power. Nothing to be feared. A casual precedent that should echo loudly around the region. "It establishes a link between performance and accountability - knowing that if you don't perform you can be thrown out of power by the electorate, not by the military," Adekeye Adebajo, from the Centre for Conflict Resolution in Cape Town, told me by phone. "It's an incredibly powerful incentive for better governance in the future. "It sends a strong signal to the rest of the continent. There will be autocrats in Khartoum, in the DRC, Rwanda and Uganda, who are thinking of staying on in power. They won't welcome this." The election also gives Nigeria more credibility and clout within the West African grouping Ecowas, at the African Union, and internationally, as the continent seeks to shrug off the enduring influence of former colonial powers like France. Nigeria's leaders can no longer be dismissed as hypocrites when they lecture neighbours like Mali, Niger, Guinea and Guinea Bissau, on the need to keep the military out of politics. That can only be a good thing for African democracy. On a more nuts and bolts level, these past few days have been a valuable reminder of quite how difficult it is becoming to rig an election. Social media, fingerprint scanners, and an army of young volunteer observers armed with mobile phones have all played their role - as they have done in other recent African elections - in limiting the possibilities of ballot stuffing and other shenanigans. That's not to say people didn't try to rig this election - and won't in the future. But once the data is out there - posted online - it becomes much harder for the backroom cheats to cook the books. Then there's President Goodluck Jonathan's abrupt decision to accept defeat - a move made, I'm told, without consulting some key officials and against the wishes of many in his party. It was a bold, selfless move that may well have saved many lives in Nigeria. It will go down as a new milestone for African democracy, and may help redeem Mr Jonathan's presidency, at least partially, in the eyes of his many critics. Does that mean Nigerian democracy is safe? Perhaps not. A new man may be coming to power. But Gen Buhari is not young, and he presides over an untested coalition. He is inheriting an empty treasury - broken by falling oil prices, the cost of supporting the national currency, and now threatened with more looting by sticky-fingered officials heading for the door. Boko Haram's insurgency in the north-east remains a huge challenge to a corrupt and humiliated army. Perennial frustrations in the oil-rich south of Nigeria could well begin to boil over. The list goes on. And now comes a six-week period of administrative limbo - another new experience for Nigeria - as the old regime prepares to empty its desks, and a new team is formed. Gen Buhari has much to do, and to prove, in a short time. Image caption Muhammadu Buhari: "The victory is yours"
Who will he chose to run the economy? How can he prevent any last-minute looting? Can he get the army to secure, and build on the territorial gains it has made against Boko Haram in the last few weeks? And how will he balance the need for a smooth transition against what must surely be his instinct to make an example of those public officials who have been greedily stealing from Nigeria's oil revenues for years? Nigeria, by all accounts, is not an easy country to run. As we saw on Tuesday night with the state television's reluctance to even broadcast news of an election upset, there are entrenched interests here that will struggle to adapt. After a political earthquake, aftershocks are almost inevitable. But for now it is the optimists both in Nigeria and around the continent who must, surely, have the upper hand. The uncontestable fact of a democratic transfer of power trumps any legitimate, but unrealised concerns about whether a different president, and a different party, will actually make life better for the people of Africa's most important nation.